The Blue Cut Fire in Southern California is nearly contained after burning more than 37,000 acres east of Los Angeles and destroyed more than 100 homes. Evacuation orders have been lifted and the 82,000 displaced residents have been allowed to return home. Screen shot: Cal Fire/Twitter. 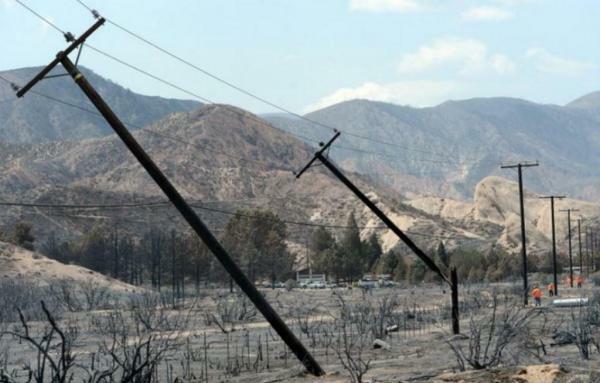 VICTORVILLE, Calif., Aug. 22 (UPI) — Evacuation orders have been lifted in San Bernardino County, and utility companies were working to restore service to residents as Southern California’s Blue Cut fire was finally nearing containment, fire authorities said Sunday. The explosive wildfire has burned 37,020 acres, and firefighters have now got the blaze 85 percent contained, authorities said as all 82,000 displaced residences were allowed to go home, though many will not have a home to return to. Cal Fire said a preliminary estimate of at least 105 homes have been destroyed and three damaged. Another 216 outbuildings were destroyed and six damaged. The cause of the fire, which began east of Los Angeles on Tuesday and quickly grew into a major blaze, is still not known. Evacuation orders are still in effect for the so-called Chimney fire in Northern California, which has scorched more than 27,000 acres and destroyed 47 structures. It remains only 35 percent contained. One of the buildings threatened by the fire is the landmark Hearst Castle, built by newspaper mogul William Randolph Hearst and the model for Xanadu in Orson Welles‘s classic film “Citizen Kane.” It was closed Sunday after the fire reached an area near the mansion’s water supply. The historic site will remain closed Monday with staff prepared to evacuate the mansion’s priceless works of art if the fire moves closer.